On Saturday 22nd, the two assault ships, five LSL's, and RFA's "Fort Austin" and "Stromness" were still in San Carlos Water. Of the original escorts, only "Brilliant", "Plymouth", "Yarmouth" and the damaged "Argonaut" remained in direct support, and "Broadsword" spent some of the time north of Pebble Island with "Coventry" as a missile trap for incoming aircraft. "Antrim" had gone, but "Ardent's" place was taken by newly arrived "Antelope", although sadly not for long. 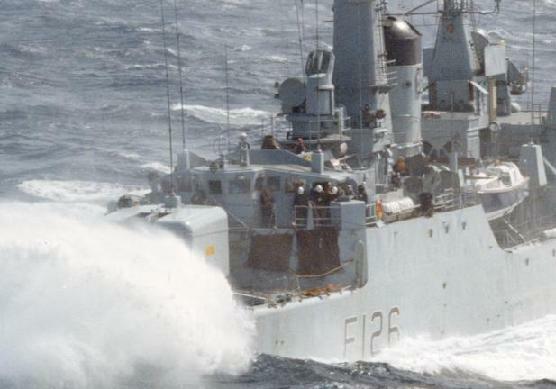 Next day, they were joined by LSL "Sir Bedivere" and frigate "Arrow" which had structural damage but could still share in the air defence. Of the merchantmen that left on Friday, "Norland" was back in to disembark her remaining troops and later take on board "Antelope's" survivors, and "Canberra" out in the holding area transferred stores to RFA "Resource" for delivery on Monday. From now on, only the more important ship movements can be followed. As air supremacy was slowly won, the carriers continued to provide the only fixed wing airpower, the destroyers and frigates escorted the transports into and out of San Carlos Water and protected them there, and also carried out bombardment, special forces insertions and other patrol duties. Meanwhile the merchantmen and RFA's kept the Task Force supplied with fuel, ammo, food and water, and other stores, and played their part in moving the troops towards Stanley. All this took the ships to various parts of the TEZ and around the Falklands, to South Georgia, and when in need of repair, to the TRALA. At the northern end of the beachhead, 3 Para patrolled to the west and north of Port San Carlos, while 42 Cdo followed up the retreating Argentine troops, but only as far as Cerro Montevideo to stay within artillery range. To the west, 45 Cdo was dug in above Ajax Bay and on the east, 40 Cdo above San Carlos and destined to spend a frustrating war mainly defending the area. In the south, 2 Para on Sussex Mountains was about to be the first unit to prepare for action. While waiting for more supplies to be unloaded and for General Moore to arrive, Brigadier Thompson at his mobile HQ at San Carlos made plans to push forward. Apart from the special forces patrols scattered about the Falklands, Marines of the Mountain and Arctic Warfare Cadre had been flown to Bull Hill and Evelyn Hill on the way to Stanley. He also decided to launch a battalion raid against the enemy forces at Goose Green, and on Sunday 23rd ordered Lt Col Jones to prepare 2 Para for this task. On the same day, 42 Cdo was ordered back from its exposed position to join in the defence of Port San Carlos, and just to the north, 3 Para suffered wounded casualties when two patrols accidentally clashed. Meanwhile as General Menendez attempted to supply his outlying forces, more Argentine ships and helicopters were lost. Late on Friday 21st, patrol craft "Rio Iguaza" left Stanley with Pucara spares and 105mm guns for Goose Green, and next morning was found and strafed in Choiseul Sound by two No.800 Sea Harriers on CAP. She ran ashore, but two of the guns were recovered and reached their destination. Then on Saturday evening "Brilliant" and "Yarmouth" searched for the captured coaster "Monsunen" known to be heading for Stanley from Darwin, and early on Sunday, "Brilliant's" Lynx located her off the east coast. A small SBS boarding party tried to capture the ship by helicopter, but gunfire drove them away. The frigates then ran "Monsunen" aground in Lively Sound, but next day she was towed into Darwin by "Forrest". Now into Sunday, "Yarmouth" returned to San Carlos Water, but "Brilliant" headed for the carriers. Finally the damaged cargo ship "RIO CARCARANA" was finished off in Port King at midday by Sea Skuas fired by "Antelope's" Lynx. Still on Sunday morning (23rd), three Army Pumas carrying ammo and stores for Port Howard, and escorted by an Agusta, were on the last leg of their dangerous flight from Stanley when they were sighted near Shag Cove House by two No.800 Sea Harriers. One Puma flew into the ground trying to escape [a45], the crew getting clear before it exploded, and cannon fire destroyed the Agusta [a46] and disabled a second Puma. Two No.801 Sea Harriers shortly arrived and finished off this one by strafing [a47]. Just one Puma survived to fly the three crews to Port Howard. Over the weekend, RAF GR.3's mounted a number of denial attacks against airstrips, and the Sea Harriers continued to fly CAP although bad weather over southern Argentina meant they were hardly needed on Saturday 22nd. The next heavy raids were mounted on Sunday when the FAA also started using Grupo 1 Learjets as pathfinders and decoys. First to arrive in the early afternoon were four A-4B Skyhawks of Grupo 5 which found "ANTELOPE" in San Carlos Water. In a confused action which put two UXB's in her and killed one man, an attacker clipped her mast and another was shot down by possibly a Sea Wolf from "Broadsword" or a Rapier [a48]. That evening as the bombs were being defused, one exploded killing Sgt Prescott RE. Catching fire, she blew up and sank next day with a broken back. Minutes after the Grupo 5 attack, three Skyhawks of CANA 3 Esc came in but failed to hit any ships, and one crashed on landing back at Rio Grande. Two hours later, two incoming Grupo 6 Daggers were sighted by two No.800 Sea Harriers, and as they tried to escape, one was destroyed over Pebble Island by Sidewinder [a49]. That same afternoon, two CANA Super Etendards flew from Rio Grande on a third Exocet mission, but returned to base without finding any targets. However that evening did see the loss of a fourth Sea Harrier. As four No.800 aircraft took off from "Hermes" to bomb Stanley airfield, one hit the sea and exploded killing Lt Cmdr Batt [b15]. "Life on the ocean waves?" Some of the crew on HMS Plymouth's bridge appear to be enjoying "a sail" in more peaceful times. The day before this period in the Falkland's War, she had endured the bombing attacks on San Carlos Water. On the 8th June she was hit by cannon fire and four UXB's.